More than two weeks after losing a special election to the U.S. Senate, Alabama Republican Roy Moore has filed a last-minute court challenge to prevent state election officials from certifying his Democratic opponent’s victory. Moore filed a complaint in a state courthouse late Wednesday afternoon, just hours before Doug Jones was set to be officially declared the winner of the December 12 election, which Jones won by just over 20,000 votes. The complaint alleges Moore lost due to “systematic voter fraud,” citing higher than expected turnout in Jefferson County, the state’s most populous area, along with irregularities in 20 voting precincts in the county. Moore’s lawyers are demanding an investigation into their claims, and for the state to hold a new election. Moore has rejected calls to concede the race to Jones. John Merrill, Alabama’s secretary of state, says he has not uncovered any evidence of voter fraud. “Will this [the complaint] affect anything?” Moore asked Thursday on CNN. “The short answer is no.”If Jones’s victory is certified Thursday, he will be sworn in sometime next week to succeed Jeff Sessions, who became attorney general in President Donald Trump’s cabinet earlier this year. 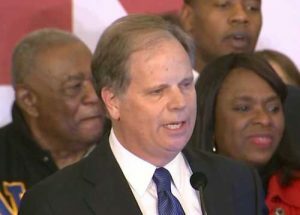 Jones is the first Democrat elected to the U.S. Senate from the heavily Republican state in 25 years. Moore is a former Alabama state supreme court judge known for his staunch religious views. His campaign was derailed when The Washington Post published allegations made by several women of sexual misconduct when they were teenagers, and Jones was a grown man in his 30s. “It’s appalling that the Democrat Senate Majority PAC and the Republican Senate Leadership Fund both spent millions to run false and malicious ads against me in this campaign,” Moore said.